Though he lived in the 13th century, Meister Eckhart is in many ways modern. His thinking was deeply ecumenical, encompassing not just Judaism, Buddhism, and Hinduism but also shamanism and indigenous spirituality. He advocated for social, economic, and gender justice; taught about what we call ecology; and championed artistic creativity. In a series of deeply inspiring and challenging metaphorical meetings, Matthew Fox introduces this pioneering medieval thinker to modern thought-leaders and activists including the Dalai Lama, Thomas Merton, Joanna Macy, Black Elk, Rumi, Adrienne Rich and others. 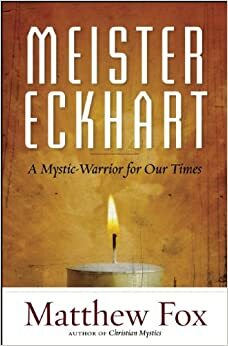 If you enjoyed Hildegard of Bingen: A Saint for Our Time, you will love Meister Eckhart: A Mystic Warrior for Our Times. “Whether our species has a future on Earth does not depend on the development of more gee-whiz technologies, but on whether we are willing to move into the psycho-spiritual dimension proclaimed by Meister Eckhart and elucidated by Matthew Fox in this important book. Now is our moment to awaken to the God-consciousness that Eckhart knew, and which many in our own time have already claimed, as Fox shows. This intrinsic aspect of who we are does not have to be acquired, for it already exists as part of our original equipment. In this endeavor, however, time is not on our side. Urgency is afoot. On this crucial journey, let Meister Eckhart and Matthew Fox be your guide. I pray this booksellszillions." "Matthew Fox is perhaps the greatest writer on Meister Eckhart that has ever existed. No one paints as broad a portrait of the Master as Matthew does in this book. He has walked with Eckhart, literally as a living presence, for over forty years. From modern feminism to archaic shamanism, C. G. Jung to Otto Rank, Ananda Coomaraswami to Bill Everson, Matthew has successfully bridged a gap between Eckhart as a shamanistic personality and Eckhart as a post-modern mentor to the Inter-faith movement, to reveal just how cosmic Eckhart really is, and how remarkably relevant to today's religious crisis! This book is a must for anyone who wants to know Eckhart intimately, in the Now. "Like Rumi, the great Christian mystic Meister Eckhart was—according to Matthew Fox’s brilliant and inspiring account—deeply ecumenical, encompassing wisdom that one can find in Jewish, Sufi, Buddhist, and Hindu mystical traditions, as well as in shamanism and indigenous spirituality. Eckhart advocated for social, economic, and gender justice. He also championed an earth-based spirituality and a cosmic consciousness, and taught that we are all artists whose vocation is to birth the Cosmic Christ (or Buddha Nature). All these elements have inspired Fox and influenced his Creation Spirituality. In this book, Fox imagines dialogues between Eckhart and Carl Jung, Thich Nhat Hanh, Rabbi Heschel, and many others. This book on Eckhart stands as testament to Fox’s own creative spiritual genius." "With all of the violence we hear on the daily news, one can lose heart for any sign of hope. However, with this book, Matthew Fox gives us an intimation that hope in the future is not some idle passing thought. That it is even possible to have written this book is a reminder that such spiritual searching and the worldwide diversity that accompanies it is more prevalent than one would think. That, to this writer, is the core value of this book, namely, the reminder that we are all searching spiritually for the same thing. This is true whether we know it or not, accept it or not, or deny it or not. The spiritual struggle of Meister Eckhart to keep religious perspective from growing stale and lifeless could not go away in his life and time, nor will it go away today." Taste the interspirituality of Meister Eckhart's teachings in the chapter excerpt, "Eckhart as Sufi," on Reality Sandwich!